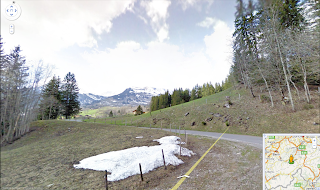 It is disappointing to see Google claim that the Swiss Data Protection Commissioner Herr Thuer 'sought to stop users from being able to enjoy exploring Swiss towns and cities on their computer'. It is more likely that Herr Ther, acting on behalf of the DPA , is seeking to regulate Google's activities with respect to privacy enjoyed by Swiss citizens. I have an odd feeling there is more to the story that Google isn't telling us. I also have a feeling Herr didn't just get a wild hair and randomly change his mind. I don't want you posting any pictures of my street either. Google are a permament invader of privacy, and I am very glad people are paying attention to that now.